(Nanowerk News) In May 2011, a new strain of E.coli bacteria claimed 50 lives and struck 4000 more people as it spread around Europe from Germany. The worst outbreak of its kind on record, the event mobilised researchers across biological disciplines to find the source of this deadly epidemic ("Outbreak genomics"). The effort highlighted a new form of scientific cooperation – crowdsourcing – in which a genetic sequence of the bacteria was released into the public domain allowing all scientists to join in the race to decode the organisms' DNA to work out how, where and why a usually harmless microbe that lives in our guts had evolved into an efficient killer. Now a new crowdsourcing effort is underway to tackle the ash dieback disease declared endemic in the UK that threatens the 129,000 hectares of woodland that Britain's 80M ash trees cover. Some BBSRC-funded scientists tackling the new scourge were involved in the original E.coli outbreak, and are revising what was learned and what more could be done in the future – for outbreaks of human disease as well as plant pathogens that threaten rural and agricultural communities. Ash dieback disease is caused by the fungus Chalara fraxinea. Infection leads to leaf loss and crown dieback (the percentage of branch tips in the crown that are dead) which leads to tree death or loss of new growth. It was found in the UK in February 2012 at a tree nursery in Buckinghamshire and originated from a nursery in the Netherlands. Since then it has spread around the UK to other nurseries, newly planted woodland and urban landscaping schemes, and as of December 2012 Defra has confirmed more than 300 cases across 115 sites. "This is a fungus causing the current serious outbreak of dieback on ash trees in the UK," says Dr Lisa Crossman of The Genome Analysis Centre (TGAC), an institute that receives strategic funding from BBSRC, who is currently working on the ash dieback crowdsourcing effort. She's collaborating with scientists from the John Innes Centre, which also receives strategic funding from BBSRC, and The Sainsbury laboratory (TSL); all three are located on Norwich Research Park. "I have looked into some annotation (identifying the locations of genes) and provided some functional data via the crowdsourcing website," says Crossman, who's been working on an infected ash twig that has sequences of both fungal and plant origin, supplied by TSL. "Some other members of TGAC are also thinking of getting involved in ash dieback crowdsourcing." Looking back at her work for the E.coli crowdsourcing project in 2011, she says they got close to the final answer quickly and may have beaten traditional methods of epidemiology (to the source of the outbreak) if more whole genome sequenced relatives of the deadly strain had been previously sequenced. Comparing the DNA of the outbreak strain, known as O104:H4, to existing strains revealed it was incorporation of genes coding for the Shiga toxin from another bacterium that made the new E. coli so deadly. By the end of July 2011, up to 50 deaths were attributable to haemolytic uraemic syndrome (HUS), a serious complication resulting in acute injury to the kidney and sometimes the brain and pancreas. Unusually, a high proportion of victims were women in good health, rather than the young and the old often who are less able to fight infections. In a deadly double-whammy, the crowdsourced analysis then revealed that along with the Shiga toxin, resistance genes against common antibiotics had also been carried over to the new O104:H4 strain, which is a worrying sign in the emergence of increasingly difficult to treat strains. On the E. coli crowdsourcing effort, Crossman says the best thing about it was the sharing between scientists and the option to discuss the full project completely openly as it went along with everyone and anyone. The project also brought to light an understanding of outbreak and foodborne infection investigations. "The worst thing about it was probably the lack of sleep!" she says. 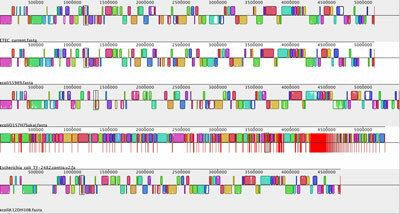 Dr Nick Loman from the University of Birmingham was the first person to post data of a reconstruction of the E.coli DNA (known as de novo assembly) of the O104:H4 bacteria on his blog (see external links) after the initial DNA sequence was released. At the time, Loman was working on a BBSRC-funded project called xBASE – a bioinformatics resource for the agri-food bacteriology community. "During the development of xBASE I was developing pipelines for the analysis of next-generation sequencing data which proved very useful in the analysis of the strain in this outbreak," says Loman. He agrees that the E. coli crowd-sourcing project showed that experts around the world can come together via the internet, blogs and social networks to quickly organise themselves to tackle important issues for society. "It also shows the power of digital genomics data that can be easily shared and interpreted," he says. Loman says the best part of working in such a way was the speed of the responses from participants and the very high quality of the analysis produced. He also adds that the University of Hamburg-Eppendorf and the Beijing Genomics Institute should take special credit for sequencing the strain so quickly and permitting the data to be released under a Creative Commons license. The worst was that the outbreak had passed its peak at the point they started crowdsourcing. "Next time we need to start analysing data even more quickly," he says. "I would have tried harder to get even more experts involved to try to go beyond the pure genomic sequence analysis to characterise the strain further." Bringing human and genetic resources together raises issues about ownership which, to be fair, are not unique to genomics or even science. Nonetheless, Loman thinks that the pathogen's biology could have been understood faster if other E.coli strains were made freely available for comparative experimental analysis. "Also, it was a shame that some groups could not contribute to the project due to artificial barriers imposed by their host institutions," he says, citing their largely theoretical issues about ownership of data. In light of the crowdsourcing effort now underway for ash dieback disease, Loman and his colleagues are still analysing the outbreak strain and considering how to use high-throughput sequencing to respond faster to new strains of bacteria in a future outbreak scenario. "I'm proud to have been a small but hopefully instrumental part of the project," says Loman. "I was very excited to see that The Sainsbury Laboratory has started a crowdsourcing project to analyse the genomics of the fungus responsible for the current Ash Dieback crisis. I am certain there will be many more crowdsourcing projects in the future."